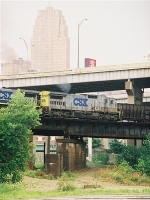 Description: 7587 is leaving the CSX A line moving to ex-Charleston and Western Carolina rails headed to Augusta, Ga. in this 2001 photo. Description: In the rain at that. Description: CP train 287 has a gray CSXT GE leading. Description: EB CSX general freight Q410 comes off the controlled siding at CP Bound Brook with power including a stealth C40-8. Description: Daily train from Taft Yard (Orlando, FL) to Waycross, Ga. Description: CSX Stealth C40-8 (Was at one point) trailing on Q322 to Flint!